Kathmandu and Chitwan tour with rafting is an exciting holiday trip in Nepal from where you will get chance to see the historical places, Jungle and River. Culture, nature and historical exploration with a soft adventure rafting on Trishuli River. This expedition offers a unique opportunity for an amazing wildlife experience, accompanied by an exceptional river rafting adventure. The trip begins with a sightseeing tour to the most remarkable places in Kathmandu. After your thorough visits to the major places of Kathmandu valley, we offer you Rafting Nepal package, which will let you, enjoy one of the most thrilling white water river rafting in the Trishuli River for around 3 hours. After a briefing about safe rafting in Nepal from your River guide, you will be all set for your rafting trip down the Trishuli River of grade 3 & 4. This rafting trip is sure to give you the most incredible experience filled with utmost thrill and excitement. After an adventurous rafting session in Trishuli, your next destination is Chitwan. 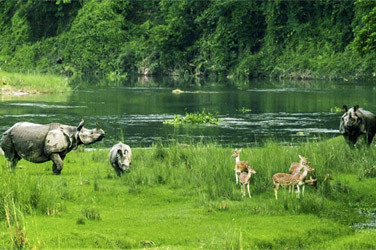 Royal Chitwan National Park situated in the tropical Terai region close to the borders with India, houses exotic flora and fauna, rich bird species and rare animals like one-horned Rhino and Royal Bengal Tiger. In the National Park you get to enjoy other activities like elephant safari and jeep safari for sightseeing exotic wildlife and diverse ecosystem, canoeing, bird watching and a walk in the wilderness accompanied by a trained guide. This adventurous trip presents you a memorable travel experience. Early in the morning you will be driven to Charaundi, and en route most amazing natural vistas of Himalayan beauty sprawls before you. On reaching the destination, you set for river rafting trip. You can dress and our rafting guide will briefing about safety way to raft in Trisuli River then you are ready to do the rafting after around 3 hours rafting then finish your rafting continue drive to Chitwan national park check in hotel.